Viola sororia, from Plant Conservation Alliance. Public domain. Shy violet. Shrinking violet. Wild violet. Common. Weed. Beautiful. Elusive. So many ways to describe this flower and the characteristics associated with it. Violet is the state flower of Illinois. Violet is so common, and thus so easily overlooked, that no one seems to agree on exactly which species of the plant was singled out for this honor—the dooryard violet (Viola sororia)? The birdsfoot violet (Viola pedata)? Almost 100 species of violet grow in the state, and most are indistinguishable to the untrained eye. Nearly 500 species of violet grow all over the world. 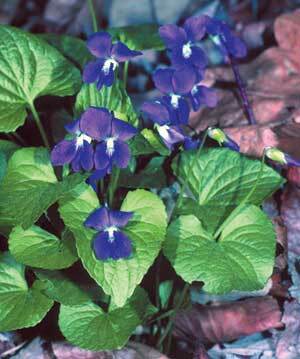 Pansies and johnny-jump-ups are some of the cultivated relatives of the wild violet. Viola odorata, the fragrant violet, is the species that appears in most herbal manuals. This backyard plant is prized for its famously elusive scent. It takes a huge amount of violet flowers to produce a useful amount of perfume, so today most perfumers buy their violet from a laboratory. If not from my love’s breath? 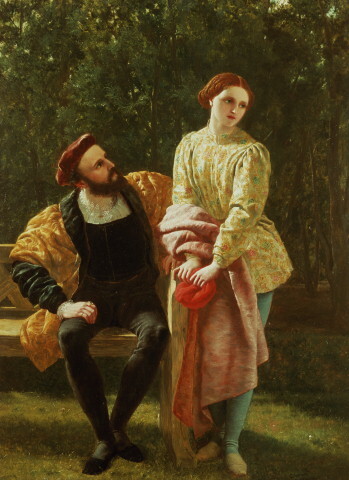 Orsino and Viola, by Frederick Richard Pickersgill. Public domain. Shakespeare named the leading lady of Twelfth Night after the flower, and like the flower, Viola hides her beauty in plain sight, posing as a boy and falling in love with the Duke she serves. 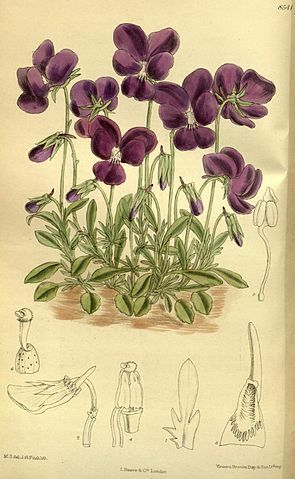 Francis Bacon liked the violet too: “That which above all others yields the sweetest smell in the air, is the violet…” Violet was the symbol of ancient Athens, and Napoleon Bonaparte chose the violet as the emblem of his political party. Not bad for a dooryard plant. Violets are often associated with the fleeting beauty of youth, for like most wildflowers, their flowers do not last long after being cut. The flowers have been incorporated into beauty regimens since at least the Greeks, as an ingredient in salves, creams and poultices for the skin as well as in perfume. Pliny states that wearing a garland of violets will dispel the fumes of wine and fend off drunkenness. Alas, no modern authors support this claim. Botanically, the violet’s most interesting feature is its reproductive strategy. The violet is cleistogamous, that is, a hidden fertilizer, a characteristic it shares with several other wildflowers (Oxalis and Impatiensamong them). The showy purple (or lilac, pink or white) flowers that appear in the spring are fully formed and lightly scented, seeming ready to attract insects; but they bear little to no seed. A second round of flowers appears in the fall—flowers without petals, hidden among the leaves of the plant, seemingly insignificant—but full of seed. Violet can also throw out runners and produce new plants without using seed at all, a strategy that greatly annoys the suburban lawn cultivator. Viola odorata, Brno-Obřany, Czech Republic. Photo by Petr Filippov. GFDL. In the North American flower essence repertory, Viola odorata is used for those who shy away from groups for fear that their delicate nature will be submerged. Like the plant that bears a beautiful flower for the world to see while doing the actual work of reproduction in private, Violet types need to find a balance between sharing their refined sweetness with others and protecting their deepest selves. This is a common pattern among artists. Many of us walk a fine line: we need exposure, a greater audience for our work, better connections to colleagues and friends, a network of exterior support. Yet the bulk of our work is done deep within ourselves, making solitude necessary to our survival as well as our art, and we dread being over-exposed. Violet is a bridge between these conditions, easing the transition from interior work to the outer world. Violet leaves and flowers are edible. 100 grams of fresh green leaves contain 264 milligrams of ascorbic acid (a component of vitamin C) and 20,000 IU of vitamin A. Medicinally, the dried leaves are taken as tea and used to ease fibrocystic breasts and other breast swellings. There is a history of using violet leaves to treat tumors, especially of the skin, the breasts, and the glands. The leaves were taken internally as a tea and applied to external tumors through baths, compresses, or poultices. The high salicylic acid content of fresh leaves is thought to be the active component here. I don’t know of any modern studies that corroborate violet’s cancer-easing properties. For many decades the most popular use of violet was to ease coughs and sore throats. “Syrup of Violet”, made from the violet flower, was used for this purpose and as a laxative, particularly for infants and children. Violet leaf tea can soothe coughs and sore throats. Viola gracilis, from Curtis’s Botanical Magazine, 1914. Public domain. Several themes emerge from violet: the overlooked beauty; the plant that shows the world a gorgeous flower, but does its real work in the interior; a common “weed”, stubbornly spreading, that has the power to nourish and soothe us. Next time you see a violet—and you may have to look closely, as the purple flowers are already gone for the year—think about the ways you protect and nourish your inner soul, and how you find the courage to show your creations to the world. For more on the historical uses of Iris, and a great deal of information on how to cultivate them, see Mrs. Grieves’ A Modern Herbal. 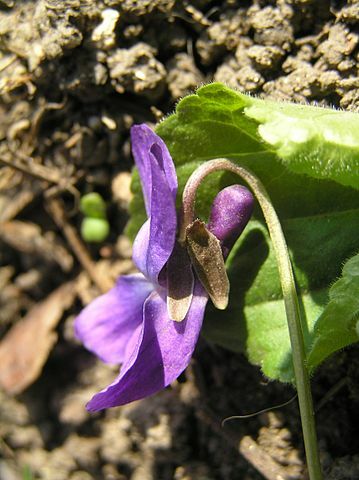 My favorite book on Violet and other dooryard herbs is A Wise Woman Herbal, by Susun Weed. Viola sororia: http://commons.wikimedia.org/wiki/File%3AViola_sororia.jpg, accessed 5/27/2012. Orsino and Viola: http://commons.wikimedia.org/wiki/File:Orsino_and_viola_Frederick_Richard_Pickersgill.jpg, accessed 5/27/2012. Viola odorata: http://commons.wikimedia.org/wiki/File:Viola_odorata2JPG.jpg, accessed 5/27/2012. Viola gracilis: http://commons.wikimedia.org/wiki/File:Viola_gracilis_140-8541.jpg, accessed 5/27/2012.